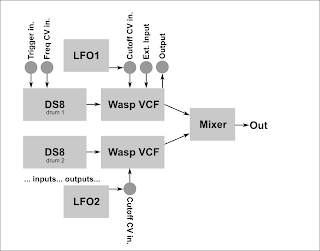 I like to run projects in parallel, so there is my new idea: I want a simple, analog drum synthesizer. I've built a Coron DS8 clone from Marc Bareille's schematics. I don't have CA3080 OTAs, so I've redrawn the circuit to use LM13700, and integrated a led driver for the incoming trigger signals. After a few hours of playing with the DS8, I've realized, that this circuit can be enhanced with a VCF. The DS8 doesn't contains a filter, only the noise spectrum can be altered with a switch. Because the DS8 is using +5V supply voltage, and the Wasp VCF also using this value, I've tried it, and built this combination, plus a piezo trigger pad into a temporary plastic case for trial. This combination sounds wonderful, warm, and analog, but it also can be harsh, distorted and rude. This VCF simply mutiplies the possibilities of the DS8. I don't want to integrate any control circuit into this machine, only the CV/control/trigger jack sockets will be built in. 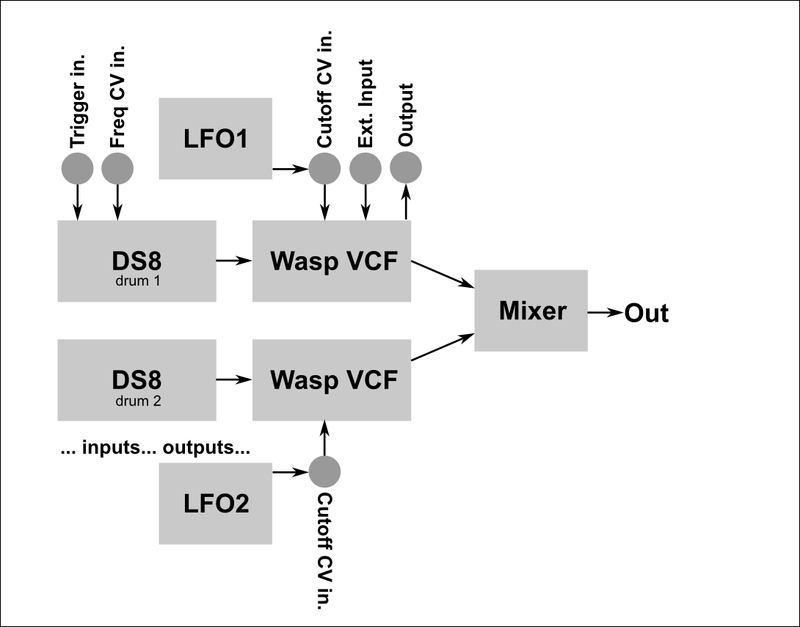 The Wasp filters can be used for external signal processing, so this unit will be an integrated drum synth and a dual filterbox.